The “Fill n Chill” party table is a snap to use. 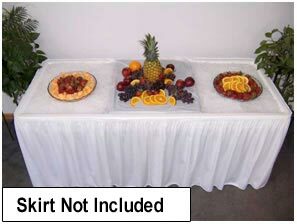 Place it in any convenient location, load it with about 75 pounds of ice, and fill it with food and drink. That’s all there is to it. You’re ready to have a good time and not worry about keeping cold food fresh. Plus you won’t have to fret over how to stuff all that stuff into your refrigerator. “Fill n Chill” makes life simple at picnics, reunions, birthdays, graduations, or any occasion where large quantities of food need to be kept cold. There is no more constantly running to the refrigerator, or guests congregating in your kitchen. 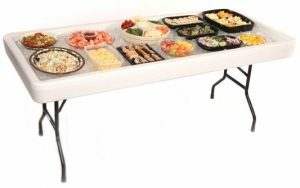 With the “Fill n Chill” table filled and chilled, your guests and you will enjoy your get-together, and you won’t have to worry about food spoilage and warm, tasteless drinks.